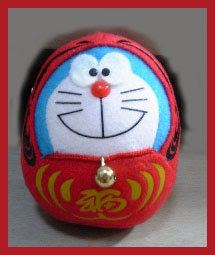 is a Japanese confection consisting of a small round mochi (glutinous rice cake) stuffed with sweet filling, most commonly anko, sweetened red bean paste made from azuki beans. Daifuku comes in many varieties. The most common is white-, pale green-, or pale pink-colored mochi filled with anko. These come in two sizes, one approximately 3cm (1.2in) diameter, the other palm-sized. 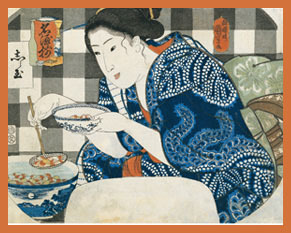 Some versions contain whole pieces of fruit, mixtures of fruit and anko, or crushed melon paste. Nearly all daifuku are covered in a fine layer of corn or potato starch to keep them from sticking to each other, or to the fingers. Some are covered with confectioner's sugar or cocoa powder. Though mochitsuki is the traditional method of making mochi and daifuku, they can also be cooked in the microwave. Mochi and daifuku are very popular in Japan. 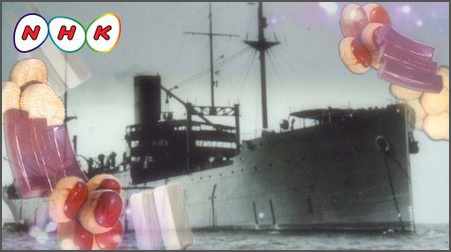 Daifuku was originally called habutai mochi (腹太餅) (belly thick rice cake) because of its filling nature. 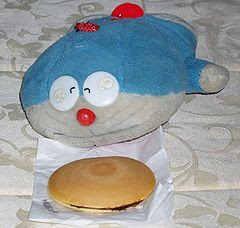 Later, the name was changed to Daifuku mochi (大腹餅) (big belly rice cake). 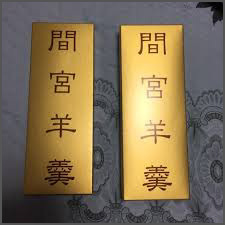 Since the pronunciations of fuku (腹) (belly) and fuku (福) (luck) are the same in Japanese, the name was further changed to Daifuku mochi (大福餅) (great luck rice cake), a bringer of good luck. 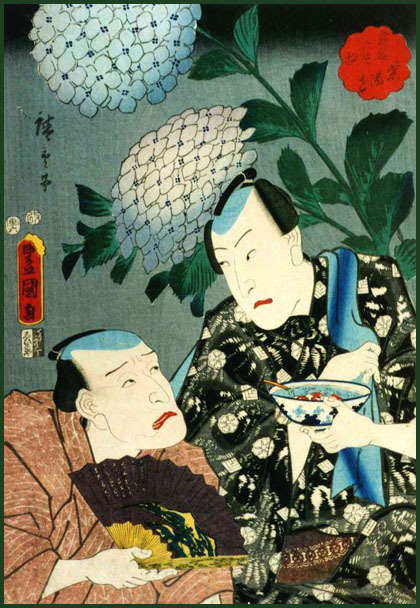 By the end of the 18th century, Daifuku were gaining popularity and people began eating them toasted. 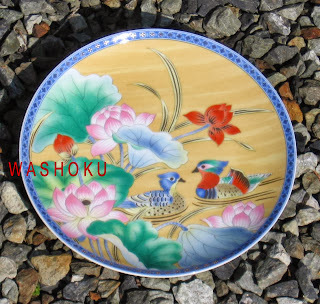 They were also used for gifts in ceremonial occasions.
. goroawase　語呂合わせ　wordplay . Some food names come up in the wordplay, especially with numbers for the days of a month. 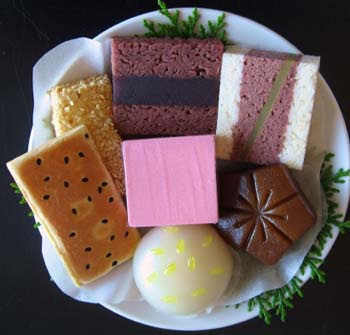 Some depend on the look, like a roll cake looks like number 6.
. All about MOCHI 餅 . 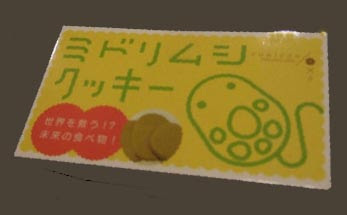 A brand of mochi ice cream made by the company Lotte. 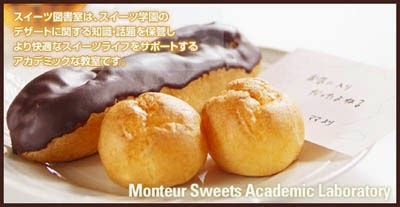 It consists of a ball of vanilla ice cream wrapped in a thin layer of mochi, or rice cake. 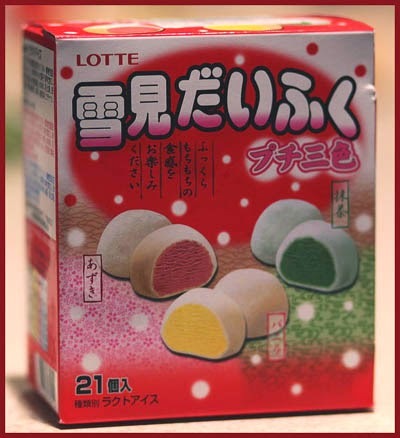 Lotte originally created Wataboshi (Japanese: わたぼうし "cotton hat or capped with snow"), a bite-size ice cream wrapped in a thin layer of marshmallow in 1980. 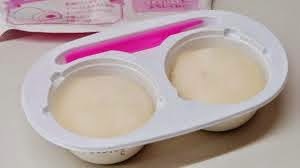 Marshmallow was quickly replaced by mochi because it is more popular in Japan and the company perfected a technology to keep mochi soft at freezing temperature in 1981. 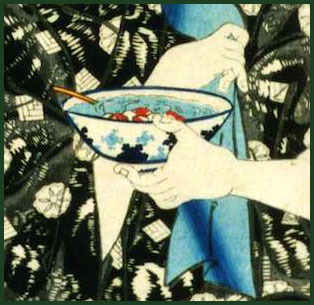 Yukimi is a seasonal activity in Japan, similar to hanami, consisting of watching snow falling. 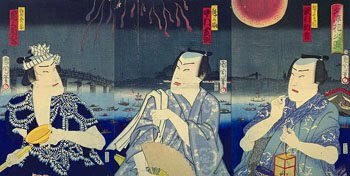 The name is a word play (goroawase) upon tsukimi daifuku (月見大福, "moon-viewing daifuku"), the sweets traditionally eaten while viewing the moon. 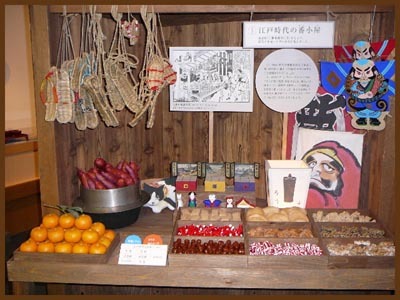 18 : when you open the package, there are two sweets and a pink stick on the side, looking like 18.
. anko 餡子 red bean paste .
. Kokubun-ji Daifuku 国分寺大福 Kokubunji-Dumpling . Mochi made whith white anko and mochigome rice.
. wasabi daifuku わさび大福 . 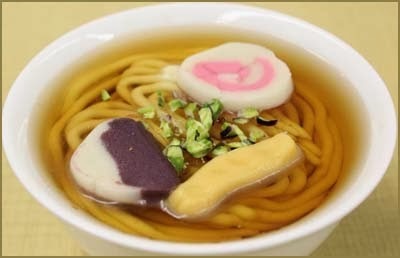 nanchatte raamen なんちゃってラーメン sweet "noodle soup"
A confectionery store in suburban Saitama is generating a buzz thanks to its uniquely deceiving assortment of sweets. One of them is the “Nanchatte ramen,” which can translate roughly as “fake ramen noodle.” The name sounds like a Chinese dish, but in reality it’s a cake — that looks exactly like ramen. 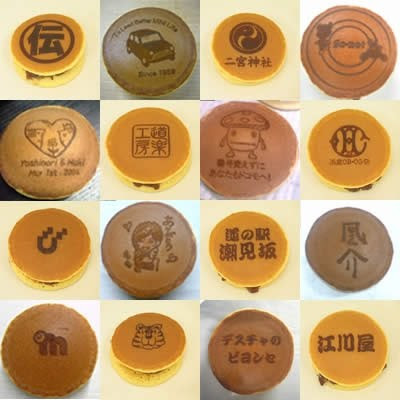 “I wanted to create sweets more amusing and with more impact for customers,” explained Hiromichi Iino, president of the Japanese and Western confectionery store Baigetsudo in Honjo, Saitama Prefecture. 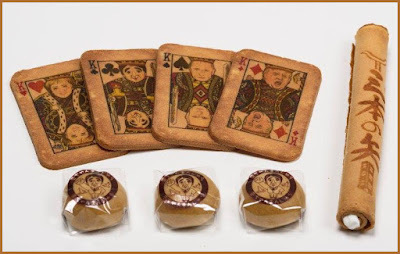 The store was founded in 1897 and sells traditional Japanese confectionery, including “monaka,” a treat with adzuki bean jam filling sandwiched between two wafers. For the finishing touch, several items made from “nerikiri” bean paste are placed on the surface of the “broth” to substitute for common ramen toppings, including “char siu” pork and “menma” lactate-fermented bamboo shoots, while pistachios stand in for green onions, Iino said. The hard part about creating this dish was finding an appropriate combination of ingredients to ensure it tasted good, Iino said.
. Wagashi　和菓子 sweets from Japan . ***** . Raamen, Ramen, ラーメン Chinese noodle soup . They are put in a coating of flower, sugar and water, and then deep-fried, eaten for oyatsu snack in the afternoon in some snowy parts of Iwate prefecture, bordering to Akita. During the long winter months, when heavy snow made it impossible to leave the valley, bisquits were easy as a staple food, and making them to tempura gave extra calories to pass the winter months. 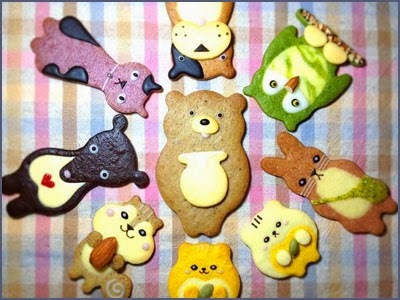 kaasan ketto かーさんケット "mom's biskits"
The Green Gables bakery in Tokushima makes chocolate cookies that look like an iPHONE. The application icons are all deliciously edible. Sales of Lucky Trump cookies, maple-flavored and featuring a cartoon image of U.S. President Donald Trump, initially outpaced those of bean-paste filled buns bearing Abe’s image, according to vendors who sell the items in the gift shop at the Diet building. drops in a glass of milk . . .
Midorimushi, the little green insect, is now researched in Japan for its power as food and bio-fuel. Euglena is a genus of unicellular protists, of the class Euglenoidea of the phylum Euglenozoa (also known as Euglenophyta). They are single-celled organisms. Currently, over 1000 species of Euglena have been described. Some Euglena are considered to have both plant and animal features. A Euglena is a protist that can both eat food as animals by heterotrophy; and can photosynthesize, like plants, by autotrophy. Euglena can survive in fresh and salt water. In low moisture conditions, a Euglena forms a protective wall around itself and lies dormant as a spore until environmental conditions improve. Euglena can also survive in the dark by storing paramylon granules in pyernoid bodies within the chloroplast. Euglena is rich in nutrients and contains paramylon. Currently there is one Euglena product already in the market. The product contains Euglena, royal jelly, condroitin, and brewers yeast. The product is advertised as a dietary supplement, an antioxidant, and as a colon cleanser. Researchers are now looking into other possible uses of Euglena such as the application of the protists' paramylon as cosmetics, biodegradable film, and pharmaceuticals. It lowers fat and cholesterol and is good for your health! In a powder preparation it can be placed over white rice and eaten as a kind of chazuke, with hot green tea poured over the mix. Watching some researchers taking out water with bristling midorimushi from the pond in Ueno, bringing it to their laboratory nearby and making new experiments for food products. A bakery in Tokyo offers this special service. On a "paper" made by some kind of gelatine the chef uses a special "copy maschine", a cake decorating printer, where the ink is made from oficcialy approved edible colors. He has the permission of the Ministry of Health and Welfare to make these cakes. You bring a photo and he will make a delious cake with lots of whipped cream and strawberries, and on top the sweet copy of your photo. It takes about four days preparations. The colors might get a bit off, but they sure look delicious ! 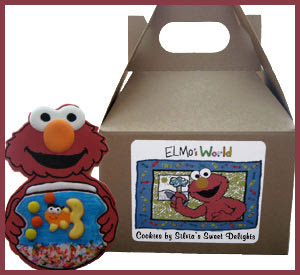 Sesame Street is an American educational children's television series and a pioneer of the contemporary educational television standard, combining both education and entertainment. Sesame Street is well known for its Muppets characters created by Jim Henson. It premiered on November 10, 1969, and is the longest running children's program on US television.The show is produced in the United States by the non-profit organization Sesame Workshop, formerly known as the Children's Television Workshop (CTW), founded by Joan Ganz Cooney and Ralph Rogers. Before the show's premiere, the producers created five one-hour episodes for the purpose of testing whether children found them comprehensible and appealing. "Sesame Street is best known for the creative geniuses it attracted, people like Jim Henson and Joe Raposo and Frank Oz, who intuitively grasped what it takes to get through to children." click the image for many more !